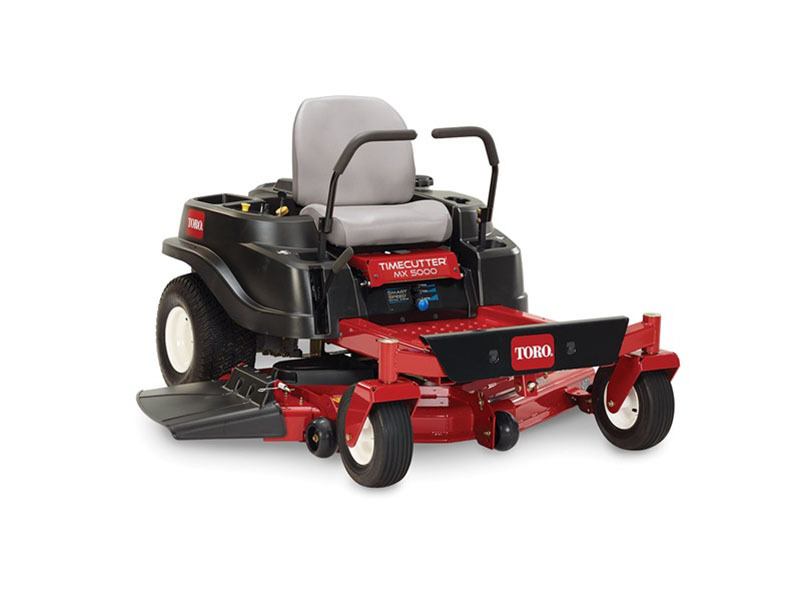 The TimeCutter® MX5000 zero turn lawn mower is powered by 24.5 hp Toro® V-Twin 708 cc engine with self-cleaning airbox. Featuring a 50 in. 10 ga. fabricated steel mowing system with convenient washout port. With great features like our exclusive Smart Speed® control system it allows you to choose from three speeds giving you greater control when trimming, towing attachments and mowing. FABRICATED DECK: Welded together from plates of 10 ga. steel and a bull-nose bumper leading the way, this deck can handle tough conditions. The lower the gauge the thicker the steel. HEAVY-DUTY 10-GAUGE FRAME: The heavy-duty 10-ga. frame provides increased strength, durability and reliable performance. The lower the gauge the thicker the steel. HITCH KIT STANDARD: Hitch kit comes standard on all TimeCutter® models. It's easy to increase the versatility of your zero turn mower by attaching a dump cart, de-thatcher, fertilizer spreader or other Brinly-Hardy attachments. HIGH BACK SEAT: When you're mowing for an extended period, there's no substitute for a good seat. The 15 in. (38.1 cm) high back seat offers premium support during longer mowing sessions. The gross horsepower of these engines was laboratory rated by the engine manufacturer in accordance with SAE J1940\. As configured to meet safety, emission and operating requirements, the actual engine horsepower on these mowers will be significantly lower. Fabricated Steel - 10 ga.